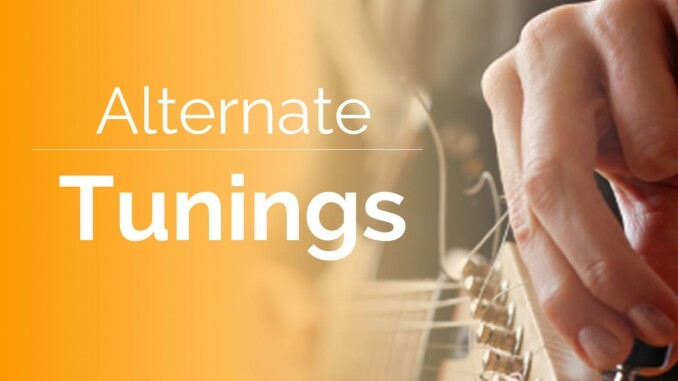 People use alternate tunings for a number of reasons, but the main reason is to make fingerings easier. For example, slide guitarists use alternate tunings all the time to allow the slide to play chords. Another reason to use an alternate tuning is to change the open strings. Some people like to double notes to get a droning sound. Doubled notes also make it easier to form chord voicings in the new tuning. I highly recommend that you know your intervals and chord construction theory before you try to learn alternate tunings. If my free lessons aren’t enough, I recommend picking up a copy of Guitar Lesson World The Book, which covers these topics and more. You want a working knowledge of intervals so you know how the tuning changes your chord grips and scale patterns. Memorizing a new set of grips from a chart is doable, but it is easier to adjust the ones you know. This exercise will help you memorize them on your own. You know how to tune your guitar, but do you know the intervals between the strings? Knowing them helps you figure out the intervals of alternate tunings. I reference my intervals from the lower-pitched (higher-numbered) string. For example, the interval from the 6th string (E) to the 5th string (A) is a Perfect Fourth. The interval between the 3rd and 2nd string is a Major Third. The interval between the other strings is a Perfect Fourth. Knowing this will help you with other tunings. This is the easiest of the tunings to learn. I know you didn’t read this lesson to learn to tune 1/2 step down. That is self-explanatory. Do you know why guitarists like Jimi Hendrix and Stevie Ray Vaughan use this tuning? Use it when you want a deeper sound without changing your chord grips. Use it when you want looser strings. By tuning a half step down, you lessen the string tension and make bends easier. Listen for buzzing. When you lower the string tension, the strings vibrate more. If a string hits a fret, you might hear it buzzing. Tuning to 1/2 step down can be done by lowering all of the strings by a half step. Follow these instructions to tune to this. Drop D is another popular tuning. You only need to lower the 6th string from an E to a D. This will make the interval between the 6th and 5th string a Perfect Fifth. You can do this in one step. Some tremolo systems have a quick switch that will instantly drop your 6th string a whole step down to D. I have one on my Peavey Wolfgang. I rarely use it, but it’s nice on a guitar with a locking nut. Drop D is used to make some chords easier to play. This is especially true of power chords. I just mentioned that the new interval between the 6th and 5th strings is a Perfect Fifth. That is the exact interval to make a power chord. Now you can play power chords by barring the 4th, 5th, and 6th string (and you can play an open D power chord). This is great for rock rhythms. You’ll also notice that the 6th and the 4th strings are doubled by one octave. Since only chords that use the 6th string are changed, it limits the new chords that you need to learn. This tuning is all about droning sounds in the key of D. The intervals get interesting. DADGAD is primarily used to get a droning sound in the key of D. With 3 D strings and 2 A strings, you have the root and 5th. The trick to playing DADGAD is realizing the benefits. Strings 4-6 are just like Drop D. Strings 1 and 2 give you the same intervals as standard tuning. The main string to fear is the interval change between the 3rd and 2nd strings. When I think of DADGAD, I try to approach it from how it can change my sound. You want to utilize the tuning’s advantages. In this case the doubled notes are the key. Power chords are made very easy. In the key of D, you have D-E-F#-G-A-B-C#. You get your D5 power chord by playing D and A together. You get your G power chord with G and D. You get your A power chord with A and E. That is a I, IV, and V chord. This makes it easy to create a blues progression. You can build on these by adding a third to make the chord major or minor. All you need to do is lower the 5th of the power chord by 1 and 1.5 steps to create a major and minor chord respectively. If you want a 7th chord, lower one of the root notes by a half or whole step to play a major 7 or minor 7 chord. To reuse what you know, chart the chords you know that only use strings 3-5. They are exactly the same. Also use the Drop D chords that you know. There are many other alternate tunings. When you explore them, use them to their advantages. Doubled notes allow you to easily modify to create a new chord. It also helps you get a droning sound. If you’re playing slide, it helps you play the chords that you want.